27.02.2017 (Hvino News). What's the connection between basketball and qvevri wine? In case of the Boisa Brandy & Wine, the connection is Vladimer Boisa - a former Georgian basketball player who played for Slovenian Union Olimpija team. Boisa, born in 1981 in Rustavi (Georgia), is vice-president of the Georgian Basketball Federation. As a 17-year-old he went to Slovenia. After work in Italy, Russia, Greece he returned to Ljubljana. In recent years he dedicates most of his time on his second passion – winemaking, in the village of Shalauri, near Telavi. After launching his wine under Boisa brand name, he launched his Boisa VSOP brandy. 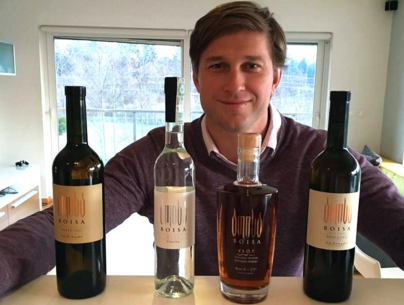 Apart from Georgia, Boisa’s wine is sold in Slovenia and Austria. Vladimer explained: "We make wines in a cellar that belongs to my friend Otar Bregvadze. The place was built by his grandfather. I have been interested in winemaking since childhood and I have always loved this job. That is why I decided one day that it would be great to make Rkatsiteli using old Georgian tradition. 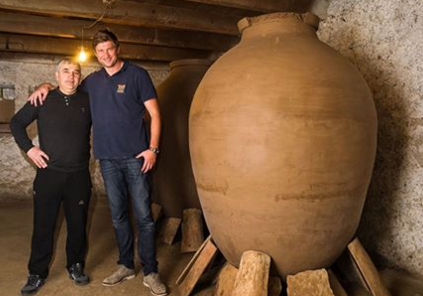 This tradition is 8 000 years old and we keep wines in 100-year-old kvevris. We had the first harvest in 2014 and the next year we already bottled several liters. At first I thought of making wine only for myself and my friends, but then I realized that I liked this process and decided to make more wine and start my own business. Many experienced people helped me with advice and it was really helpful. The bottles and the labels were designed by a famous Slovenian designer. I love Kakheti and I love this job". "The main thing is that I am alone. Only one partner helped me in Slovenia, who put small amount of money in my brand distribution and helped me somehow. In Georgia my partner is Otar Bregvadze. My sister is the company director and I am a key figure, in practice. I think I do not need assistance of more people", said Vladimer. The biggest investments were made in labeling. Slovenian designers created labels that make the products more attractive. Now Boisa is producing about 5 000 bottles a year. "By 2020 we want to increase the number of bottles to 10 or 15 thousand. Our goal is to increase production and if everything goes well, we want to widen the business. Our wine is sold in Tbilisi’s Wine Gallery and several shops and restaurant. One bottle costs GEL 22 and I am happy to hear that many experienced winemakers like what we do." "I do not know whether this is high price or not, but it is impossible to sell our product for lower price", - added Vladimer Boisa.